Office 365, Microsoft’s cloud-based productivity suite, includes online versions of Microsoft’s most popular solutions, like Exchange and SharePoint, storage through OneDrive, and several mobile apps, including Word, Excel, PowerPoint, OneNote, Outlook, Publisher, and Skype for Business. Office 365 is central to Microsoft’s strategy as the company evolves into a mobile-first, cloud-first software and solutions provider. Many MobileIron customers are increasingly using Office on mobile devices instead of on traditional PCs. 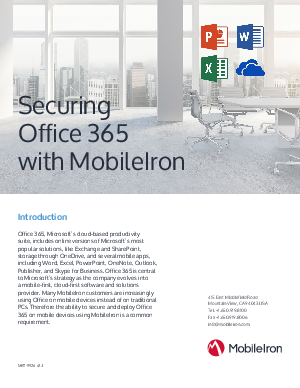 Therefore the ability to secure and deploy Office 365 on mobile devices using MobileIron is a common requirement.